I recently had my first, real archive visit to a foreign country. I had just started doing research on Hitler Youth magazines from c.1933-1938 for my dissertation and the only place to get the material I needed was in Germany. Before I had really even begun my project I had spent some time googling around where I could find primary sources for my potential project. I found the website for the German national archive and they had a list of all of their holdings, through which I found what I was looking for. It was rather easy, but it took some time to find out where everything was held. Well, I don’t know how foreign a country Germany really is, but my anxious sounding “Sprechen Sie Englisch?” came up more than once during my visit. As a first year MPhil student, this first visit was a very exciting thing for me. I’d visited the Newberry Library in Chicago, which boasts its own vast archive collection, but I hadn’t been alone and everyone there spoke English. When I arrived the Bundes Archiv, Lichterfeld in Berlin, I was terribly nervous. My heart beat fast; I felt as though I wanted to turn around and bolt back on the X11 bus and leave. The grounds of the archive are quite vast: they have four huge red brick buildings, a church, and a long white hospital looking building (all circa Nazi period, which believe me, was incredibly intimidating looking). Before being allowed inside, I had to present my passport to the security guard and after some awkward English-German mixture about why I was there, I got a visitor’s pass and locker key. After having issues of sorting out paperwork (for some reason, they had lost my file, although I had emailed them three weeks in advance) and suffering through ordering archive materials in German (you had to order before 12 pm the day before to get materials for the following morning), the rest of my time in the archive was quite pleasant. I was in a church turned into a library for most of my visit, where there were more people working there than there were visitors. For three out of my five days, I was the only under fifty year old visitor at the archive. Whenever I had to ask for help with materials, I usually got told everything in rapid German about five times—which didn’t really help—until I met someone who worked at the archive who spoke some English. We hit off really well, and the rest of my archive visit went by fast and I had company for lunch. This really vastly improved my entire visit, and it had an impact on me to further work on my verbal German skills for the next time I visit Germany for research. One of the biggest issues with archive research I found was how much material there actually was to look at and to study. I met an American woman researching at the archive, and she was shocked that I was only visiting for a week because there was no way I could get everything done in that time. She, of course, was correct by saying this. But, since I only had a week, I was able to photocopy all the material that I needed (500 pages of photocopies…) and now, back in Cambridge, the rest of my days will be going through this material. My concern right now is to find a way to go through each bit in a logical and orderly way to make sure I go through everything in-depth that I have gathered. 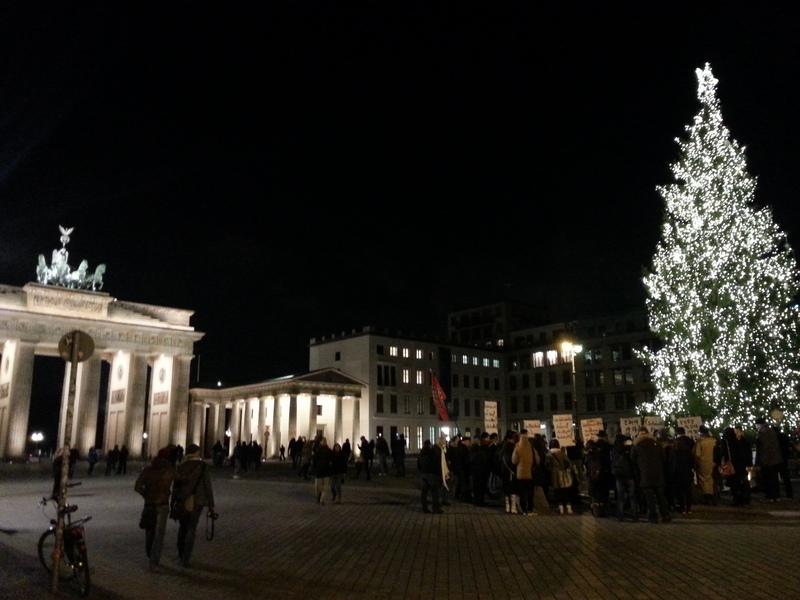 (Tiia Sahrakorpi) The Brandenburg Gate at night a few days before Christmas. I learned a lot from this visit both about Berlin and how things are done in a German archive. Berlin, a beautiful city I only got glimpses of during the evenings, is full of rich history and excitement. The only bit I got to see out of my bucket list was the Brandenburg Gate on my last evening there. Its beauty, the cold crisp air of winter blowing and fairy lights made the whole trip feel more worthwhile.